John Senden turned 40 this year but still feels that his best golf is ahead of him. The 2006 Australian Open champion is determined to add his name to the Stonehaven Cup for a second time. Senden cruised up the leaderboard to reach 12-under following today’s third round at The Lakes. His round included a chip-in eagle at the par four 6th and then another seven birdies on his way to carding a brilliant 63. 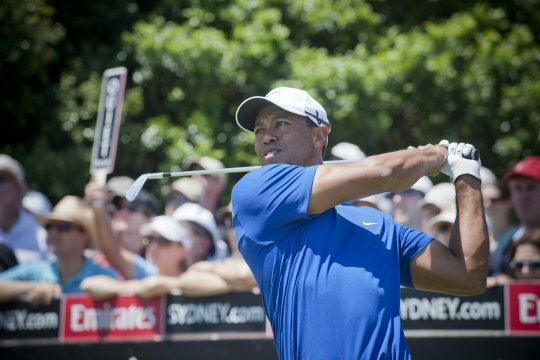 His nine-under-par round gave him a one stroke lead over fellow Queenslander Jason Day. “Today was moving day,” Senden said. Senden has recorded four top-10s on the US Tour this season on his way to accumulating US$2.3 million in prize money. “I had a good run in the US and finished off well in the FedEx. Then I had a good run in Malaysia and Shanghai,” he said. Jason Day celebrated his 24th birthday today and adding the Australian Open to his collection would be more reason to party. “I really do want to win one, really bad,” said Day, who is the only player in the field to shoot three rounds in the 60′s. Tiger Woods had waited 11 months to find himself in the lead at a golf tournament and yet it took him just three holes to lose it today. Three consecutive opening bogeys and a putter that was misbehaving resulted in Woods carding a 3-over-par, 75 – slipping from a one shot lead to six shots behind John Senden. “I just got off to an awful start,” Woods said. Despite being six from the lead, Woods isn’t counting himself out just yet. Behind the leading pair, 1998 winner Greg Chalmers was proving Woods’ point about the par-fives by taking advantage of all four amongst his seven birdies. Chalmers is at 10-under-par, two from Senden. Nick O’Hern also birdied five out of seven to stay in contention and capitalised with an eagle-birdie finish to move to nine under for the tournament and be three behind Senden. With 14 players inside the top 10 and half of those within six shots of the lead, it is still anyone’s title tomorrow.